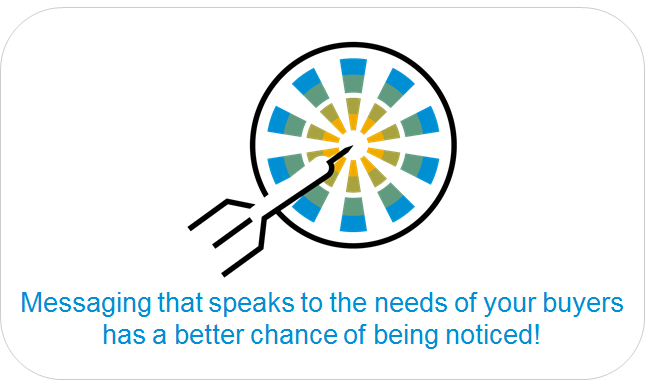 Grab your buyers’ attention – Create a value proposition that speaks to their specific needs! So, you’ve built a great offering. You believe in yourself, your team, and the products and services you’re offering, and now you’re ready to execute a marketing campaign to let your buyers know all about you! There’s a lot of noise out there! 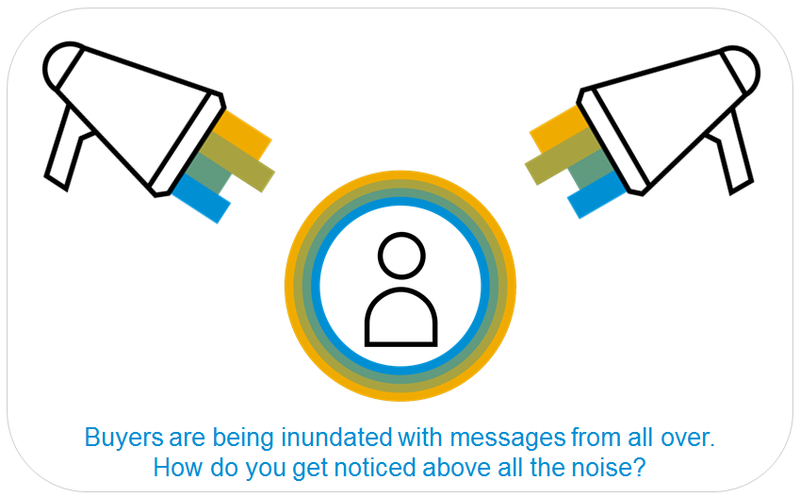 However, you’re not the only one with a marketing campaign – in fact, your buyers are likely being inundated with messaging from vendors of all stripes. Combine that with the fact that your buyers are likely extremely busy with their tasks, and you’ve got a situation where it’s easy for you to be ignored – the truth is, no matter how great a fit your offering is, your buyers don’t have the time to filter all the noise and sift through all their options, just to find you! So how do you stand out? How do you get buyers to notice you among all the other vendors out there, and consider you as someone they should do business with? It’s simple – your marketing messaging needs to speak to their needs: their goals to achieve; their problems to solve. Your messaging needs to answer the question “How will your offering make your buyers’ lives better?”. 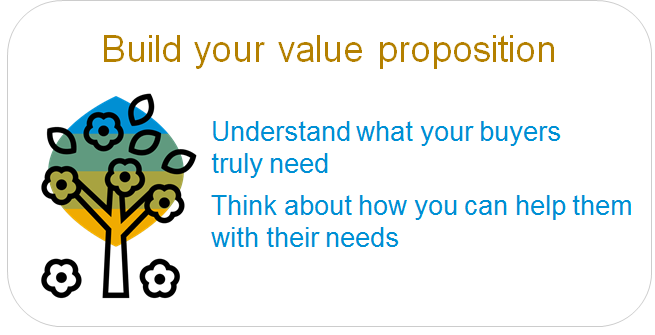 And the answer to that question is the essence of your value proposition. Marketing messaging that is built on a buyer-centric value proposition has a better chance of being noticed by your buyers! Why are you and your company the right choice for your buyers’ needs (i.e. why should they buy from you)? How will you deliver value to them – that is, how will you address their needs, goals to achieve, and problems to solve? First, you need to know what your buyers actually need. And only then will you be ready to think about how you can help them with their needs. As you answer these questions, you will start to paint a “picture” of the buyers who would select your offering. This picture or generalized representation is called a persona. Creating personas helps you to relate to your buyers as real humans, and it helps you understand the specific needs and goals of your buyers. You can learn more about creating persona records here. 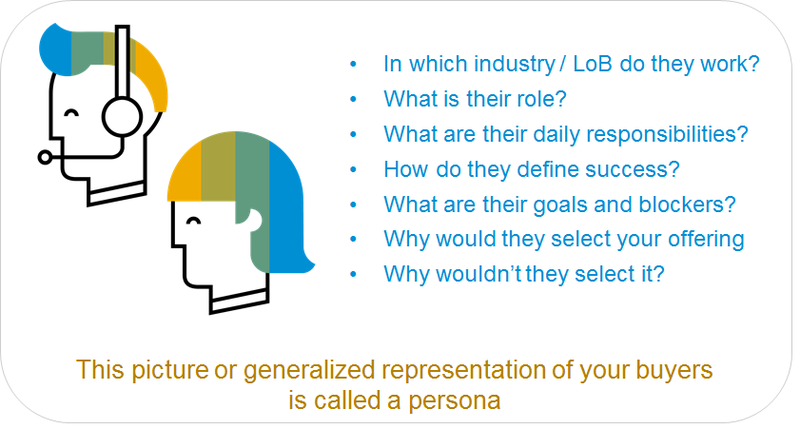 Once you have defined your company’s buyer personas, you will have a good idea of their needs – specifically, the goals they wish to achieve and the problems they wish to solve. Now, think about how your enterprise and offering can help them with these needs. 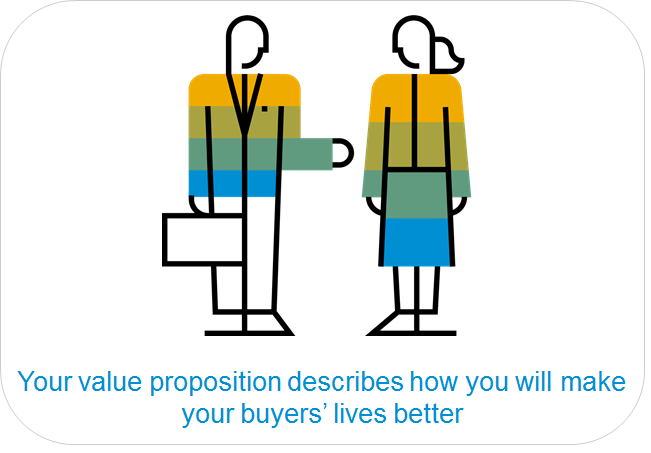 An interesting way to determine how you can address your buyers’ needs is by using a tool called the Value Proposition Canvas. It was conceptualized by a company called Strategyzer AG, and it’s available for download on their website. Job completer – How would your offering enable your buyers to do their job? Gain creator – How would your offering enable your buyers to achieve their desired gains? Pain reliever – How would your offering enable your buyers to relieve their identified pains? Of all the services you provide, which one are you the best on the planet at solving? 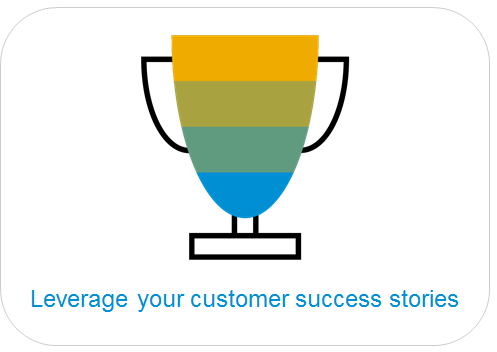 Why do your customers tell you that you win? Who refers you and why? Why do you think your customer decided to buy from you? 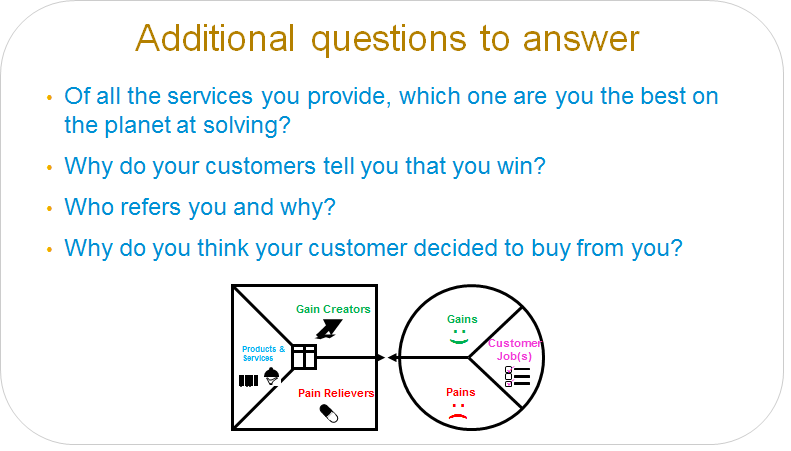 Once you have completed the value proposition canvas, you can draft one or several value proposition statements. Simply describe how you add value as a job completer, gain creator or pain reliever. Keep in mind that there are many ways to express your value prop and they can all be appropriate – it’s the overall message you are conveying that is key! When creating your value prop and the messages around it, ensure that you get to the point right away, before your buyer looks at the next vendor. 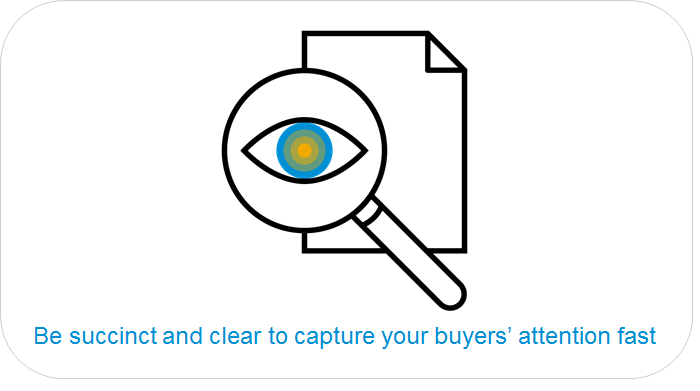 Your goal is to capture your buyers’ attention and capture it fast. Have a laser beam focus – be very specific of what you can do. Focus on a specific industry or set of customer needs. Many vendors will say that they can “do anything” because they don’t want to miss out on any opportunities out there. But by being too vague you risk diluting your impact. You can’t “speak to someone’s specific needs” by being vague. 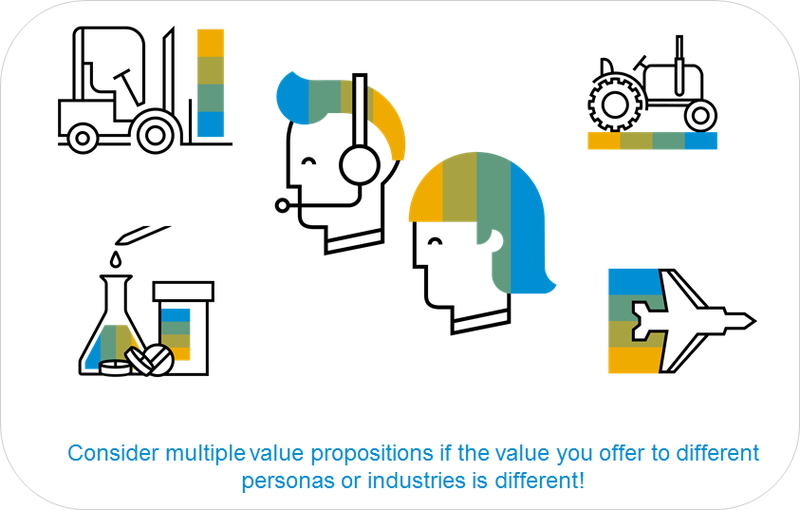 Now if you do have multiple specialties you absolutely want to point out, you might want to consider creating multiple value propositions (see below for more details). 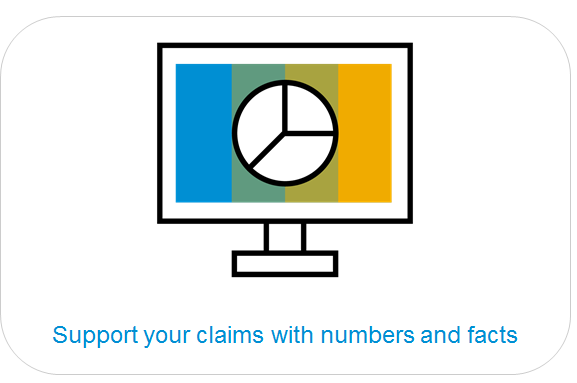 Support your claims with numbers and facts wherever possible. If you say “we always implement on time and on budget”, that sounds good – but saying “we have a 98% success rate when it comes to implementation”, sounds better – it tells the buyer that you have actually measured your performance based on established criteria. Of course the numbers you report need to be true! But the point is – if you have facts and numbers that demonstrate your value, consider including them in your messaging. Think about a successful experience you had – from the standpoint of your customer. Why was it a positive experience for them? Is it a story that other buyers would be interested to hear? Buyers like to read stories about customers in similar situations as them. They are able to identify with the issues experienced by the customer, and they will better visualize how they themselves will achieve a gain in their particular situation. You can use customer stories to take your value proposition to the next level, as they provide the proof of your promise. Is there a case to have multiple value propositions? Absolutely – especially if you have determined that you have multiple personas who would use your offering. 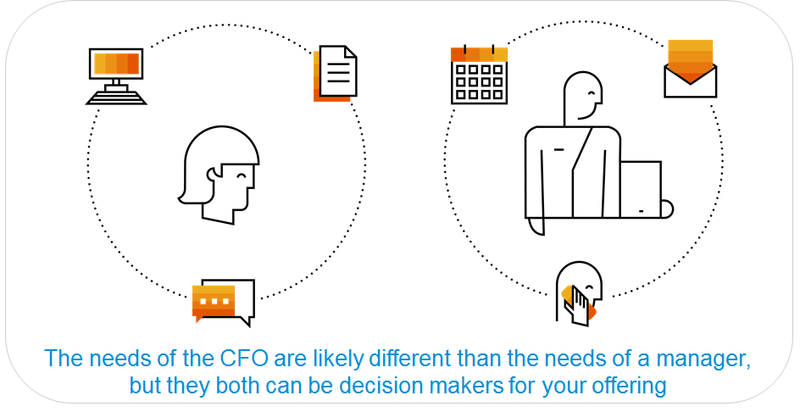 As an example, what drives and inspires a manager is likely different than that of the CTO – but depending on the company, either one, or perhaps both buyer types can be involved in the buying decision. For example, the manager might want to know about minimized down time and training support. The CTO might wish to hear about how secure your cloud infrastructure is. Another scenario is that you serve different industries, and you decide that your messaging needs to be industry-specific. Does Google show your value prop? It has been reported that 78% of B2B buyers start their research on the Internet with a Google search. Each Google search result includes the page title, URL, and a short description, called a “snippet”. The snippet is used to give readers a better description of the search result. Make sure that you work with your marketing team to find ways to display your value proposition in your search result snippet. 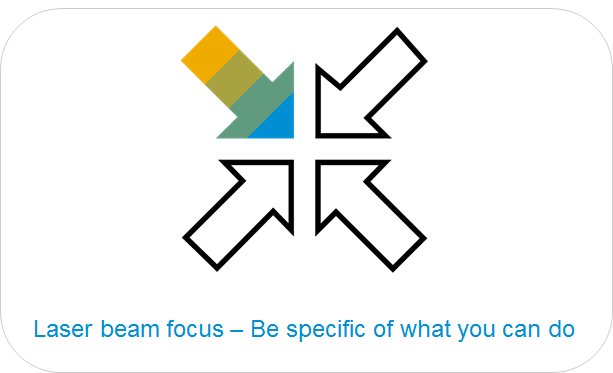 Does SAP Partner Finder listing show your value prop? Is your enterprise listed on SAP Partner Finder? In addition to your company name, logo and contact information, you can provide a short description of your company that viewers will see in the partner listing. However you craft your description, make sure that you communicate your value proposition right away! While each of these statements have their place in a marketing and branding strategy, none of them are appropriate as value propositions – they are too vague and they’re not buyer-centric; they’re focused on how great the vendor is and how many features they have to offer. Your value proposition is completely focused on your buyers and communicates how they will benefit if they choose your company and offering – make sure it’s the foundation of much your marketing messaging. When your messaging describes how your offering can help your buyers complete their jobs, achieve their desired gains, and deal with their existing pains, it will speak to their specific needs, and you have a better chance of capturing their attention!